Galicia, Guatemala, Nicaragua, Spain; Acoma Pueblo, Badian in the Philippines, Guayaquil, Sahuayo, Santiago de Querétaro, etc. James, son of Zebedee (Hebrew: יַעֲקֹב‎ Yaʿqob, Greek: Ἰάκωβος; died 44 AD) was one of the Twelve Apostles of Jesus, and traditionally considered the first apostle to be martyred. He was a son of Zebedee and Salome, and brother of John the Apostle. He is also called James the Greater or James the Great to distinguish him from James, son of Alphaeus and James the brother of Jesus (James the Just). 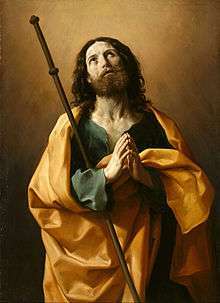 James the son of Zebedee is the patron saint of Spaniards, and as such is often identified as Santiago. The son of Zebedee and Salome, James is styled "the Greater thunder" to distinguish him from the Apostle James "the Less". He was the brother of John, the beloved disciple, and probably the elder of the two. His parents seem to have been people of means. Zebedee, his father, was a fisherman of the Sea of Galilee, who probably lived in or near Bethsaida, present Galilee, Israel, perhaps in Capernaum, and had some boatmen or hired men. Salome, his mother, was one of the pious women who afterwards followed Christ and "ministered unto him of their substance", and his brother John was personally known to the high-priest, and must have had wherewithal to provide for the Mother of Jesus. It is probable that his brother had not received the technical training of the rabbinical schools; in this sense they were unlearned and without any official position among the Jews. But, according to the social rank of their parents, they must have been men of ordinary education, in the common walks of Jewish life. James is described as one of the first disciples to join Jesus. The Synoptic Gospels state that James and John were with their father by the seashore when Jesus called them to follow him.[Matt. 4:21-22][Mk. 1:19-20] James was one of only three apostles whom Jesus selected to bear witness to his Transfiguration. James and John (or, in another tradition, their mother) asked Jesus to grant them seats on his right and left in his glory. Jesus rebuked them, and the other ten apostles were annoyed with them. James and his brother wanted to call down fire on a Samaritan town, but were rebuked by Jesus. [Lk 9:51-6] The Acts of the Apostles records that "Herod the king" (traditionally identified with Herod Agrippa) had James executed by sword. He is the only apostle whose martyrdom is recorded in the New Testament. He is, thus, traditionally believed to be the first of the twelve apostles martyred for his faith. [Acts 12:1-2] Nixon suggests that this may have been caused by James' fiery temper, for which he and his brother earned the nickname Boanerges or "Sons of Thunder". [Mark 3:17] F. F. Bruce contrasts this story to that of the Liberation of Saint Peter, and notes that "James should die while Peter should escape" is a "mystery of divine providence". The New Testament scholar Dennis MacDonald identifies Castor and Pollux as basis characters for the appearance of James and John in the narrative by Mark the Evangelist. Macdonald cites the origin of this identification to 1913 when J. Rendel Harris published his work Boanerges, a Greek term for Thunder, the epithet of Zeus father of Pollux in what MacDonald calls a form of early Christian Dioscurism. The English name "James" comes from Italian "Giacomo", a variant of "Giacobo" derived from Iacobus (Jacob) in Latin, itself from the Greek Ἰάκωβος "Iacobos". In French, Jacob is translated "Jacques". In eastern Spain, Jacobus became "Jacome" or "Jaime"; in Catalonia, it became "Jaume", in western Iberia it became "Iago", from Hebrew יַעֲקֹב, which when prefixed with "Sant" became "Santiago" in Portugal and Galicia; "Tiago" is also spelled "Diego" in Spanish and "Diogo" in Portuguese, which is also the Spanish name of Saint Didacus of Alcalá. Alternatively, Santiago is the local Galician evolution of Vulgar Latin Sanctu Iacobu, "Saint James". Saint James is the patron saint of Spain and, according to legend, his remains are held in Santiago de Compostela in Galicia. (The name Santiago is the local Galician evolution of Vulgar Latin Sanctu Iacobu, "Saint James".) The traditional pilgrimage to the grave of the saint, known as the "Way of St. James", has been the most popular pilgrimage for Western European Catholics from the Early Middle Ages onwards, although its modern revival and popularity stems from Walter Starkie's 1957 book, The Road to Santiago. The Pilgrims of St. James. Some 237,886 pilgrims registered in 2014 as having completed the final 100 km walk (200 km by bicycle) to Santiago to qualify for a Compostela. When 25 July falls on a Sunday, it is a ″Jubilee″ year (an Año Santo Jubilar Compostelano or Año Santo Jacobeo) and a special east door is opened for entrance into Santiago Cathedral. Jubilee years fall every 5, 6, and 11 years. In the 2004 Jubilee year, 179,944 pilgrims received a Compostela. In 2010 the number had risen to 275,135. 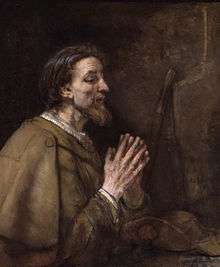 The feast day of St. James is celebrated on 25 July on the liturgical calendars of the Roman Catholic, Anglican, Lutheran and certain Protestant churches. He is commemorated on 30 April in the Orthodox Christian liturgical calendar (for those churches which follow the traditional Julian Calendar, 30 April currently falls on 13 May of the modern Gregorian Calendar). The site of martyrdom is located within the Armenian Apostolic Cathedral of St. James in the Armenian Quarter of Jerusalem. The Chapel of St. James the Great, located to the left of the sanctuary, is the traditional place where he was martyred when King Agrippas ordered him to be beheaded (Acts 12:1-2). His head is buried under the altar, marked by a piece of red marble and surrounded by six votive lamps. The 12th-century Historia Compostelana commissioned by bishop Diego Gelmírez provides a summary of the legend of St. James as it was believed at Compostela. Two propositions are central to it: first, that St. James preached the gospel in Iberia as well as in the Holy Land; second, that after his martyrdom at the hands of Herod Agrippa his disciples carried his body by sea to Iberia, where they landed at Padrón on the coast of Galicia, and took it inland for burial at Santiago de Compostela. The translation of his relics from Judea to Galicia in the northwest of Iberia was effected, in legend, by a series of miraculous happenings: decapitated in Jerusalem with a sword by Herod Agrippa himself, his body was taken up by angels, and sailed in a rudderless, unattended boat to Iria Flavia in Iberia, where a massive rock closed around his relics, which were later removed to Compostela. The tradition at Compostela placed the discovery of the relics of the saint in the time of king Alfonso II (791-842) and of bishop Theodemir of Iria. These traditions were the basis for the pilgrimage route that began to be established in the 9th century, and the shrine dedicated to James at Santiago de Compostela, in Galicia in Spain, became the most famous pilgrimage site in the Christian world. The Way of St. James is a tree of routes that cross Western Europe and arrive at Santiago through Northern Spain. Eventually James became the patron saint of Spain. James suffered martyrdom[Acts 12:1-2] in AD 44. According to the tradition of the early Church, he had not yet left Jerusalem at this time. An argument supporting this assertion is based on St Paul's Epistle to the Romans, written after AD 44, in which he expressed his intention to avoid "building on someone else's foundation",[Rom. 15:20] by visiting Spain[Rom. 15:23-24], suggesting that he knew of no previous evangelisation in Hispania. The tradition was not unanimously admitted afterwards, while numerous modern scholars, following Louis Duchesne and T. E. Kendrick, reject it. (According to Kendrick, even if one admits the existence of miracles, James' presence in Spain is impossible.) The Bollandists however defended it (their Acta Sanctorum, July, VI and VII, gives further sources). The suggestion began to be made from the 9th century that, as well as evangelizing in Iberia, his body may have been brought to Compostela. No earlier tradition places the burial of St. James in Hispania. A rival tradition places the relics of the apostle in the church of St. Saturnin at Toulouse; if any physical relics were ever involved, they might plausibly have been divided between the two. The authenticity of the relics at Compostela was asserted in the Bull of Pope Leo XIII, Omnipotens Deus, of 1 November 1884. A similar miracle is related about San Millán. The possibility that a cult of James was instituted to supplant the Galician cult of Priscillian (executed in 385) who was widely venerated across the north of Iberia as a martyr at the hands of the bishops rather than as a heretic should not be overlooked. This was cautiously raised by Henry Chadwick in his book on Priscillian; it is not the traditional Roman Catholic view. The Catholic Encyclopedia of 1908, however, is quite cautious about the origins of the cult (see above at "Controversy"). James' emblem was the scallop shell (or "cockle shell"), and pilgrims to his shrine often wore that symbol on their hats or clothes. The French for a scallop is coquille St. Jacques, which means "cockle (or mollusk) of St. James". The German word for a scallop is Jakobsmuschel, which means "mussel (or clam) of St. James"; the Dutch word is Jacobsschelp, meaning "shell of St. James". James had a special place in the Central African Kingdom of Kongo because of his association with the founding of Christianity in the country in the late 15th century. Portuguese sailors and diplomats brought the saint to Kongo when they first reached the country in 1483. When King Afonso I of Kongo whose Kongo name was Mvemba a Nzinga, the second Christian king, was facing a rival, his brother Mpanzu a Kitima, in battle, he reported that a vision of Saint James and the Heavenly Host appeared in the sky, frightened Mpanzu a Kitima's soldiers, and gave Afonso the victory. As a result, he declared that Saint James' feast day (25 July) be celebrated as a national holiday. Over the years, Saint James day became the central holiday of Kongo. Taxes were collected on that day, and men eligible for military duty were required to appear armed. There were usually regional celebrations as well as one at the capital. In some cases, Kongolese slaves carried the celebration to the New World, and there are still celebrations of Saint James Day in Haiti and Puerto Rico. 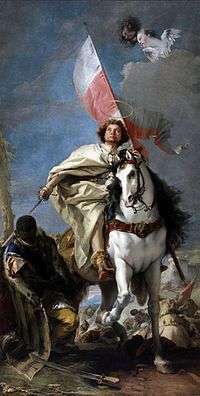 1 2 "Catholic Encyclopedia: St. James the Greater". ↑ Matthew 17:1-9, Mark 9:2-8, Luke 9:28-36. ↑ R. E. Nixon, "Boanerges", in J. D. Douglas (ed. ), The New Bible Dictionary (London: The Inter-Varsity Fellowship, 1963), 1354. ↑ Dennis MacDonald, The Homeric Epics and the Gospel of Mark, Yale University Press, 2000, pp 24-32. ↑ J. Rendel Harris, Boanerges, Cambridge University Press, 1913, pp 1-4. 1 2 New York, E. P. Dutton, 1957, OCLC 28087235; reprinted by the Univ. of California Press in 1965 (OCLC 477436336) and published in Spanish translation in 1958 with the somewhat different title of El camino de Santiago: las peregrinaciones al sepulcro del Apóstol, trans. Amando Lázaro Ros, Madrid, Aguilar, 1958, OCLC 432856567. Both the English original and the translation have been republished. ↑ Doctrine and Covenants 27:12.